Why do we visit places associated with famous writers? What motivates our visits and how do these experiences make us feel? Alongside the Placing the Author conference we are launching the Postcard Project to find out more about present-day literary tourism practices. Many of us will have visited sites associated with nineteenth-century writers such as Dove Cottage, Jane Austen’s House, the Brontё Parsonage, 84 Plymouth Grove, 48 Doughty Street and the Keats-Shelley House in Rome. This project seeks to explore what compels these visits – is it curiosity, an interest in the individual or the period, a desire to connect with the writer or their work on a deeper level? How do we feel about these places, before, during and after our visits? We are inviting speakers, conference delegates and anyone else who has visited a site connected with a nineteenth-century writer to share a photo of yourself taken on the spot and to reflect upon why you went and what you got out of the experience. These sites might include birthplaces, residences, gravesites, monuments, museums, and blue plaques. To take part in the project, all you need to do is to send us a photo, telling us when and where the photo was taken, why you went (max 100 words) and what you got out of the experience (max 150 words). You can email your photo and response to placingtheauthor@gmail.com or tweet us @placingauthor. After moderation the responses will be posted on the Placing the Author website and form part of a roundtable discussion at the conference on 20 June 2015. 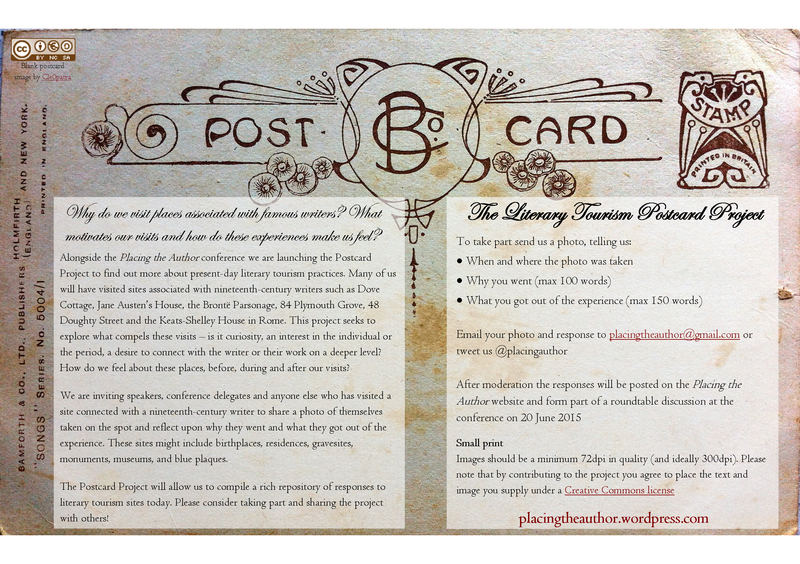 The Postcard Project will allow us to compile a rich repository of responses to literary tourism sites today. Please consider taking part and sharing the project with others! Contact us at placingtheauthor@gmail.com if you have any questions. Download and share the Call for Postcards here. Images need to be a minimum 72dpi in quality (and ideally 300dpi for printing). Please note that by contributing to the project you agree to place the text and image you supply under a Creative Commons license (ideally Attribution CC BY). You can find out more about Creative Commons licenses here.